Minister of State, Joseph Harmon has reaffirmed the Government’s commitment to rebuilding infrastructure and supporting efforts, which will foster unity and cooperation throughout Guyana. 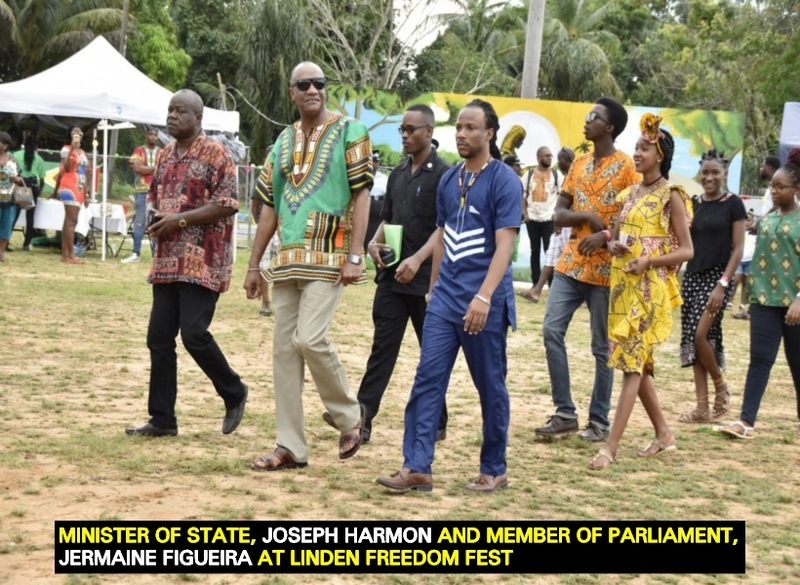 Harmon did this as he delivered the feature address at Freedom Fest 2018, held in Linden, Upper Demerara-Upper Berbice (Region Ten) to commemorate the 180th anniversary of the abolition of slavery. With this commitment, Minister Harmon noted that the revenue earned from the oil and gas sector is expected to fuel the promised infrastructural developments. “Guyana is on the cusp of great things… I believe that… we have a resource blessing and I believe that all Guyanese must embrace it. We must embrace it to the extent that it’s going to transform our lives. We must embrace it to the extent that it will make things different for us. We must embrace it to the extent that it [becomes] the movement for that good life which we promised you… The revenue from oil will be used to deal with our physical infrastructure. It will be used to develop our roads. It will be used to develop our streets… The resources from oil will be used to fix our schools… our health system… our farm to market roads, and more importantly, it will be used to push our agricultural development… We’re going to be an ‘oil nation’, but not a ‘dependent-on-oil nation’,” he said. In this regard, he encouraged the Lindeners to take hold of all of the opportunities in Guyana, which will become available in the various sector as Guyana embraces its bright future. “I want to say to you, the people of Linden, that better things… are in store for you… I’m urging you to grasp these opportunities. Grasp the opportunities that are provided by the rejuvenation of cooperative societies. Grasp the opportunities that are provided… by the input we’re going to make in the physical infrastructure of our communities. Grasp the opportunities that are provided by the input we will make in education… in health… in the tourism sector and in the ‘green’ economy… Grasp these opportunities. They are there for you… You are free and your Government is working with you to ensure that that freedom, which was hard-fought for, is actually [beneficial] and you can make a good life for yourself,” he said. Region Ten Member of Parliament, Jermaine Figueira thanked Minister Harmon for his significant contribution to Freedom Fest. “We must give thanks to the Government for partnering with us… Special thanks to Minister Harmon for coming on board significantly… Thank you for coming on board and [celebrating] with us,” he said.